My bicycle with 70cm J-pole antenna attached to the carrier. During the summer season I sometimes travel to work by bike. It’s a 21 km trip through the countryside, passing cornfields, orchards, deer and spoonbills. The road includes dikes and bridges, and even a ferry to cross one of the branches of the river Rhine. Especially in the early morning it’s a real pleasure to enjoy all the surrounding nature. I thought it would be nice to chat with some local radio amateurs on my way back home. 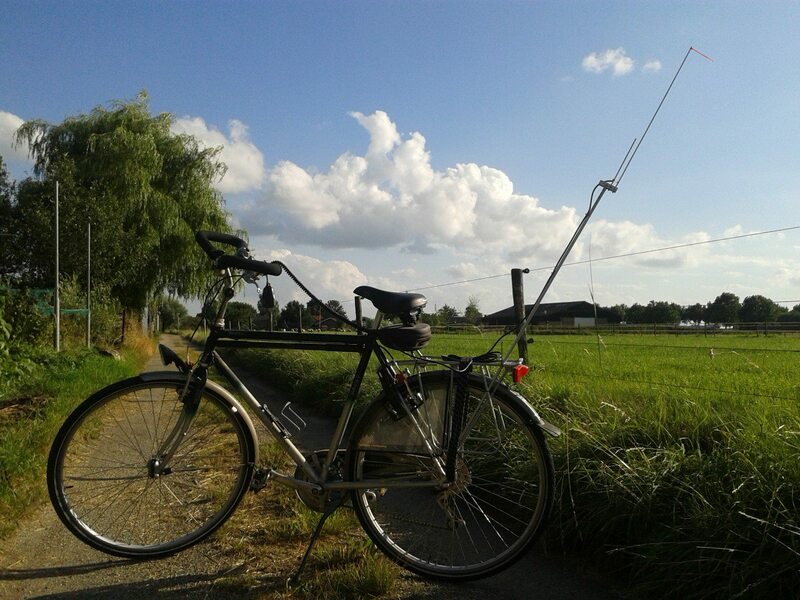 I often talk to Adrian PA0RDA while driving home (by car) after work, using the local 70cm repeater PI2ZST, so I decided to prepare my bike for this UHF band. I already own a Kenwood TH-F7 handy. I bought a small lightweight headset to allow easy operation of this radio: the Kenwood KHS-22. It includes an adjustable boom microphone, a small windscreen and an inline PTT button. The wire is long enough to attach to the radio, which is placed in a small bag attached to the saddle. I needed just one more thing: a lightweight 70cm antenna, mountable on a bike. I went into my shed and within an hour I built a small aluminium J-pole antenna on a boom. I attached it to one of the carrier stands, as far as possible to the rear side of my bike. The tip of the antenna is about 160cm above the road. Last week it was perfect weather to travel by bike, so I gave it a try. I left work, went on the road and gave a call on the repeater. Adrian replied and first thought I was in my car, still parked at work. Then I told him I was cycling through the village, he was really surprised. There was some wind, but the windscreen did a good job, my modulation was not interfered by the wind at all. I went on while talking with Adrian, the distance to the repeater increased. During the whole trip the QSO continued without any problems. Sometimes people along the road looked a bit funny, wondering about that strange guy passing by, with a headset and some strange pole on the back of the bicycle. Even when I was at the ferry (which is very low, just above the water and behind a dike) I was able to continue the QSO, maritime mobile with my bike (outstanders could think I was on a paddle boat hi). This project learned me that the J-pole is a very nice antenna for the 70cm band. I really love its simplicity (construction) and characteristics, especially on VHF and UHF. In the past I successfully built J-poles for 2m, 10m, 15m and 17m. Now I have one for 70cm as well. 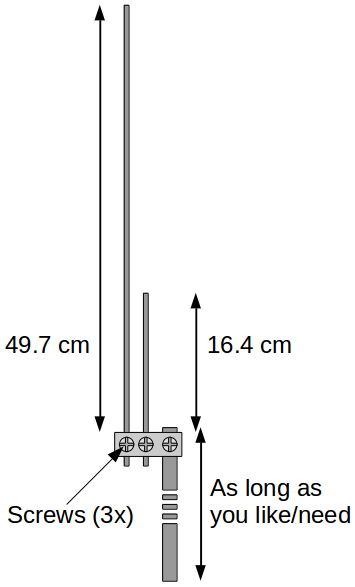 Drawing of the 70cm bicycle antenna, showing the construction and sizes. 15 x 15 mm square pipe (aluminium), length about 6cm. All parts are made of aluminium, except the screws/bolts which are made of stainless steel. I used a small piece of square pipe for the base of the antenna. The 2 rods are mounted through the base, each secured with a small screw. The pole is made of a thicker rod, mounted the same way to the base but facing down. I used cable ties to mount the antenna to the carrier. For this test setup I also used ties to attach the feeder to the antenna, I still need to replace these with small stainless clamps. The length of the rods can be easily adjusted by loosening the screw, sliding the rod through the base to get the right size, and fastening the screw again. The coax core is connected to the long end, the braid to the short end, both about 2-3 cm from the bottom (adjust this to tune the antenna to 50 ohms). Hello, I would like to built such an antenne but cannot really figure out on the photo’s how the coaxial cable should be connected. I assume it is on the J-pole fashion so the shield is connected to the larger element pointing upwards and the core (center conductor) on the smaller element pointing upwards. And all of the elements and base and down going part are all electrically connected to each other? Hi Rob, the coax core is connected to the long end, the braid to the short end, both about 2-3 cm from the bottom. 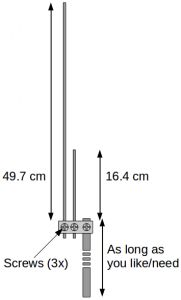 Good luck building the antenna, if you’d like, please send me a picture of your result and I will add it to this article. I added a line to the article explaining how to connect the coax cable to the antenna.